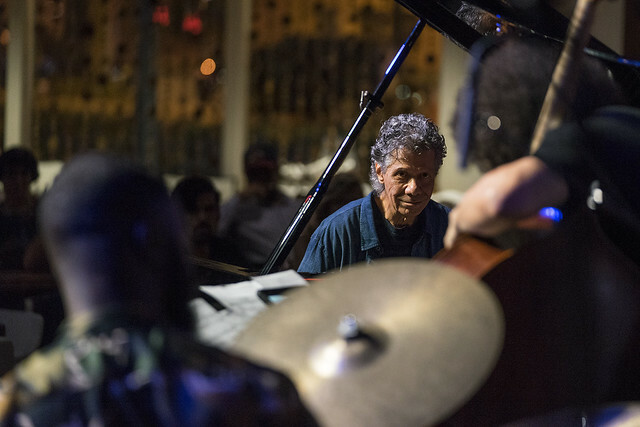 Supported by the prodigious progeny of two celebrated jazz innovators, master performer Chick Corea offers four lucky crowds a demonstration of the genius of his craft at Jazz at the Bistro. September at the Ferring Jazz Bistro has developed a tradition of bringing in some of the greatest names in jazz to warm things up before the new season begins, a tradition that continues in 2018 with a man who has been shaping the face of the genre for more than a half of a century. Even the most abridged biography of his career includes working with and even leading some of the most formative musicians of their time and advancing fusion and the sounds of electronic instruments in a time of acoustic dominance. With the very history of the music in his pocket, Chick Corea brought his handpicked trio to Grand Center for a two-night, four-performance stay, and I was fortunate enough to join the second performance on Tuesday night. The set opened with a lighthearted take on Irving Berlin's “How Deep Is the Ocean,” a piece Corea has embraced in many of his acoustic arrangements throughout the years. His right hand dominated the soundscape throughout much of the piece, delivering cascading phrases that danced up and down the scales and explored the full range of the piano's upper register. It wasn't long before Carlitos Del Puerto was offered a solo on the upright bass. He started intentionally clumsy, patiently pausing and stumbling through phrases, each moment anticipating the next. As the solo developed, the short phrases became a continuous flow and the young bassist favored the precision of the highest notes available, wrapping his arms around the instrument in a delicate embrace as he played. The solo was followed with a brief introduction to Marcus Gilmore and his drum arrangement, as he and Corea traded fills and riffs to the amazement of everybody in the room. The crowd offered their appreciation at every opportunity, applauding every solo and roaring at the conclusion of each selection. They were not alone, however, as Chick Corea was one of the most appreciative fans in the bistro, often cheering and even standing up to briefly applaud his bandmates' performances. Corea's demeanor was jovial and light throughout the evening, introducing each song, often with a note of its significance to him or his career. He joked that as it was their first night playing together since a live recording near the beginning of the year, the audience should expect it to resemble a rehearsal more than a performance. They even went so far as to replay the ending of “Continuum,” hoping to get it somehow improved from the already stellar first attempt, and without surprise achieving that goal the second time around. As the set moved on, Corea and company included covers that ranged from the upbeat fun of Fats Waller's “Jitterbug Waltz” to the relaxed mood of Bill Evans' “Turn Out the Stars,” but largely favored Corea's own compositions. “Continuum,” a piece composed for solo piano, was translated to the trio format and then “Lineage” gave the band an opportunity to defy expectation and break from the more traditional progressions within the song. It also gave Gilmore his best opportunity of the night to impress, providing a solo that danced around his array of floor toms and made use of a rather unusual second hi-hat that was comparatively smaller in diameter and lightly muted with a bunch of artificial grapes draped across the top, creating a sound that more closely resembled a rim shot than a standard cymbal. The final selection of the night started unusually without any introduction from Corea, starting even before the applause had subsided from the previous number. Entitled “Fingerprints,” Corea revealed to me after the show it was inspired by his friend Wayne Shorter's celebrated “Footprints.” It opened with perfectly timed hits and chords from the piano before a breakdown that gave Del Puerto and Gilmore the spotlight. Corea added some rhythmic accents by plucking the strings inside of his piano, eventually developing into full band groove that seemed to add a little shake to all the shoulders in the room. It featured extensive displays from the drums and bass before the trio closed together to an immediate uproar of applause. They immediately joined together at the center of the stage to hug and congratulate each other on a great performance before taking a final bow and gracing the audience with a courteous mingle on their way offstage, capping off a night of exquisite musical performance with a memorable handshake or picture to seal the experience. Chick Corea Trio at Jazz at The Bistro, 9/11/18. Photos by Tim Farmer. Head over to our KDHX Flickr page to see the full set of photos from the evening.